To do that, select the chart and then click the Chart Elements button that appears next to the chart. A list of chart elements appears. You can then select the chart elements you want to appear on your chart. Axes: Sometimes an axe is what you’d like to use to fix your computer. But in this case, axes refer to the X– and Y-axes on which chart data is plotted. The X-axis is the horizontal axis of the chart, and the Y-axis is the vertical axis. For 3-D charts, a third axis — Z — is also used. The Axes control lets you show or hide the labels used for each chart axis. Axis titles: These titles describe the meaning of each chart axis. Most charts use two axes titles: the Primary Horizontal Axis Title and the Primary Vertical Axis Title. Chart titles: A chart title describes the chart’s contents. It normally appears at the top of the chart, but you can drag it to any location. 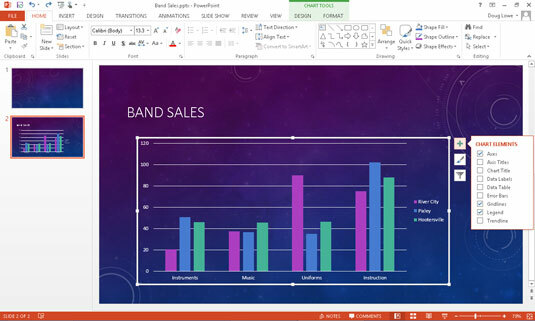 Data Labels: Lets you add labels to the data points on the chart. 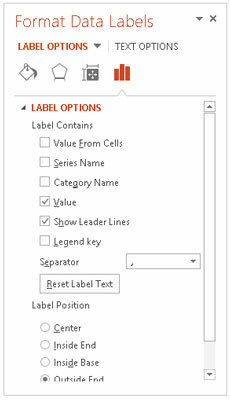 For maximum control over the data labels, choose More Options to display the Format Data Labels task pane. For most slide types, data labels add unnecessary clutter without adding much useful information. Use labels only if you think that you must back up your chart with exact numbers. Data Table: The data table is a table that shows the data used to create a chart. Most charts do not include a data table, but you can add one if you think your audience will benefit from seeing the raw numbers. Error Bars: Adds a graphical element that indicates a range of values for each point rather than a single point. The size of the range can be calculated as a fixed value, a percentage of the point value, or a standard deviation. Gridlines: Gridlines are light lines drawn behind a chart to make it easier to judge the position of each dot, bar, or line plotted by the chart. You can turn gridlines on or off via the Gridlines button. Legends: A legend identifies the data series that appear in the chart. When you click the Legend button, a menu with several choices for the placement of the legend appears. 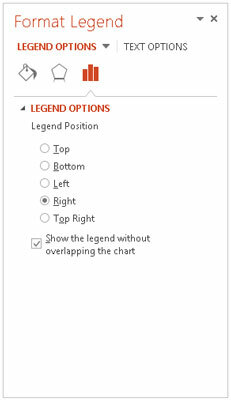 You can also choose More Legend Options to display the Format Legend task pane. 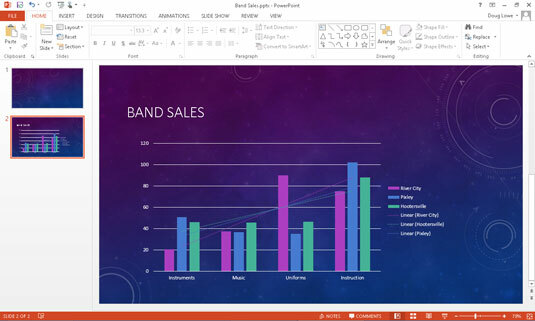 PowerPoint enables you to create a legend, but you’re on your own if you need a myth or fable. Trendline: Allows you to add line elements, which shows the trend of one or more data points, using one of several methods to calculate the trend.